I could stare at this for hours, looking at every detail about how the water pours over the rocks, creating a continuous splash, swirls in a pattern that is both chaotic and controlled at the same time, and a fine mist that sprays outward from the surface it lands on. No matter how many times I see waterfalls like these, it always fascinates me that some of the water that cascades downward takes on the appearance of foam, as if it was not water at all, but had taken on another form. Watching the water rapidly descend and subsequently take on this different form feels reminiscent of a human being that undergoes an experience that is both traumatic and transformative. The water, traumatized by unexpectedly falling rapidly, suddenly exudes a sudsy and bubbly appearance. The amount of raw power that is created when large amount of water steadily pour over a rock. The variance in colors that appear as a result of every small scale detail about how the rocks are arranged. The changes in the manner in which the atmosphere feels in proximity to this phenomenon. All of this creates a level of curiosity and fascination in me reminiscent of an 8-year-old at a science museum, in awe by dinosaur bones and that electricity ball that makes people’s hair stand up any time they put their hands on it. How did the rocks come to be formed in this manner? Why did the water chose this path on its way to the ocean to complete the water cycle? And, in this case in particular, how did this happen in a place so unexpected? Falls Park is not only in a section of the country that is quite flat (Eastern South Dakota), but it is also right in the middle of a city (Sioux Falls). Everything about its location is contrary to what most people think of when they imagine encountering waterfalls. Yet, it is there, powerful and beautiful. It is also not just one waterfall, but a series of waterfalls that cover a surprisingly long section of the Big Sioux River. The park itself spans 123 acres, includes a restaurant, permanent sculptures, and gets lit up for the holidays in December. It does for Sioux Falls what Central Park does for New York, and Golden Gate does for San Francisco. It is the place in the heart of town that is natural and scenic, providing a kind of convenient short-term escape from day-to-day urban concerns. However, given its location, surrounded in all directions by flat lightly forested grassland and corn fields, a waterfall like this feels like it is not supposed to be here. Sioux Falls is a city in the Great Plains. The other cities in the region are bisected by rivers that gently flow towards the Mississippi in some capacity, not cascading waterfalls that are typically found in mountainous terrain. Sioux Falls captures the imagination much in the same way light switches captivate a 9 month old, or magnets a 4 year old. It is not what is expected. It is not what it is supposed to be. Places like this, people like this, and ideas like this are what makes life interesting. Sure, we are all comforted when what is around us, including the people we interact with, follow some sort of pattern, behaving as expected. However, without the mavericks out there, the teacher with a strange method of reaching students, those that quit stable jobs to start a business, and that one person in your social circle who always has a story from last weekend about something the rest of us could never even imagine doing, things can get quite stale. Therefore, for the same reason I salute the first person to decide to travel the world by bicycle, I salute Sioux Falls for not being what it is supposed to be! This entry was posted in geography, Scientific Phenomenon, self-determination, South Dakota, Waterfalls and tagged Sioux Falls, South Dakota, travel, Unique Natural Features, Waterfalls on August 20, 2018 by Stephen Jaye. 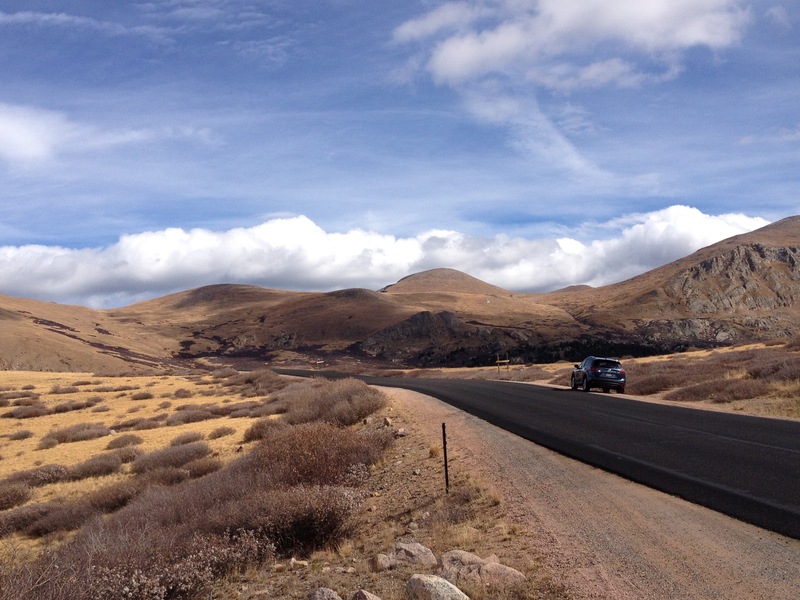 The hike from the Conundrum Trailhead to Conundrum Hot Springs is roughly 8.5 miles. Round trip is at least 17 miles of hiking. I say AT LEAST as I have been on plenty of hikes where side excursions, both planned and unplanned, lead to covering a total distance that exceeded the official distance of the hike. Due to the distance, and the destination, nearly all the people we encountered on this hike were backpacking. This is an attractive option, as the trail is pretty long but not terribly challenging, and the hot springs are the kind of destination one would want to spend a significant amount of time at. However, Conundrum Hot Springs is a popular destination, and there are limited camping sites in the immediate vicinity of the springs. Conundrum Hot Spring is close to Aspen, which is three and a half hours from Denver. Some of the people in our group, myself included, were not able to leave early enough on Friday for us to be confident that we could secure a camping spot. We ended up deciding to find a campground somewhat close to the trailhead, and hike to and from the springs as a day hike. As an added bonus, we would not have to bring, or carry nearly as much equipment, as we would be “car camping”. The hike would be both easier and harder. We would not be carrying nearly as much weight, but we would be cramming 17 miles of hiking into one day. Up in the mountains of Central Colorado, trees change color earlier in the Fall than they do in many other parts of the Country. In general, the second half of September, and maybe the first few days of October, is the best time to see the Aspen trees here change colors. I was partially surprised by how vibrant the colors were, by September 16th. For the first two hours or so of the drive, before sunset, we saw a preview of the kind of colors we’d be seeing during the hike, certainly early season, but vibrantly colorful, with sections of bright yellows and oranges periodically appearing in front of us. To be sure we would have enough time, we had to wake up, eat breakfast and leave the campground at Lincoln Creek (dispersed camping roughly 40 minutes from the trailhead) all before sunrise. We arrived at the trailhead and started hiking at roughly 15 minutes after 7 A.M. The morning chill was both an obstacle and a boost. Overnight temperatures dropped to roughly 30F (-1C) at the campground. For the first 90 minutes of the hike, the ground was covered in frost. In fact, the frost even made our first river crossing a bit slippery. This morning cold made me cary several layers, adding a little bit to the weight of my backpack (although it was still way, way, lighter than it would have been had we been backpacking). However, the cold weather motivated us to begin our hike at a rapid pace. We would cover over four miles before we even reached the sun! I would describe at least the first five miles of the hike as “easy” from the standpoint of evolution gain. Many sections of the trail are actually close to perfectly flat, giving me plenty of time to take in the natural beauty that is around me, and also connect with my friends who I was hiking with. When hiking, it is challenging to have a conversation when hiking up steep terrain, but fairly easy to do so in largely flat sections. The appearance of small lakes precludes the transition to the more challenging part of the trail. This occurs somewhere around six and a half miles into the hike. First of all, there are sections that are more technically challenging, including a couple of tricky creek crossings, and a section where one must scramble over rocks. There last two miles of the trail also includes some fairly steep sections. I wouldn’t say they are overly challenging, but in the context of a 17 mile day that included hiking at a rapid pace towards the beginning, they ended up being fairly exhausting. We ended up spending roughly two hours at the hot springs (including changing and eating lunch). There were a lot of people in the hot springs, but it was not as crowded as some of us had feared. For a variety of reasons, the fall colors appeared even more magnificent on the way back down! The most significant reason had to be the manner in which the trees appeared in the mid-afternoon sun. I was also pleasantly surprised to see a significant amount of deep orange shades. In prior experience with fall in the Rockies, I had almost exclusively seen the yellow shade that seems to be the most common fall color for Aspen trees. While “autumn gold” is pretty, I had, in some ways, missed wide variety of shades that leaves on maple trees take on during fall. I would definitely describe the color we enountered as “early season”. 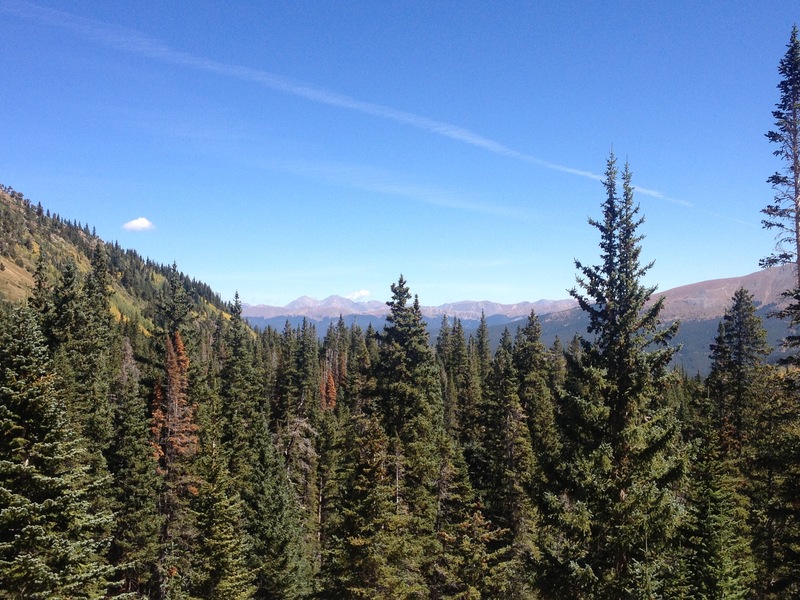 There were still many Aspen trees primarily shaded green, particularly at lower elevations. This indicates that the next two weekends could be just, or perhaps even more, colorful! The colorful trees, the yellows and the oranges, tended to be those higher up. The several patches of deep shaded orange I saw were nearly exclusively up closer to the tree line. Both the hike up to the hot springs and the return trip took roughly four hours. We got back to the trailhead sometime just after 5 P.M., and, after the 40 minute drive back to Lincoln Creek, I finally got to see what the campground looked like. And I got to do something I had not previously done. I got to park my car with the rear left tire on top of a rock, showing off just how rugged my vehicle is. Well, at least in an auto show pamphlet sort of way. Capping off an exhausting day was a side excursion, to a waterfall, well, multiple waterfalls, that those of us in our group lucky enough to be able to leave early Friday had located roughly a quarter of a mile from the campground. In fact, they hyped this place up over the course of the hike. So, we had to go. Additionally, this side excursion was enough for me to achieve something meaningless, but also something I am likely never again to achieve. I recorded 50,000 steps on that step counter thing that comes with every iPhone6. Yay me! We would explore this likely unnamed waterfall area again Sunday morning before departing for Denver. If you count all the places where water squirts out of random places in the rock, there are probably close to a dozen “waterfalls” in this area. What a great unexpected treat! The return trip on Sunday was eventful as well, with some great stops at Independence Pass and Twin Lakes, both places I had driven by on Friday, but after the sun had already set. I titled this blog “The Longest Day Hike of My Life”, as, well, I can not picture a day where I hike more than 17 miles on a day trip. However, I probably would have never imagined hiking 17 miles in one day a few years back, so there is no way to definitively say never. I am prepared, though, for this to be my longest hike, and understand the significance of it. Like many of the adventures I had over the course of this summer, and in previous years, it was both exhausting and amazing. But, most worthwhile experiences, from relationships to starting successful businesses and such, are. Being exhausted after this experience should be a reminder to all of us that what is easiest is often the least rewarding, and that which is most challenging often comes with the greatest reward. This entry was posted in Camping, Colorado, fall colors, hiking, Personal Accomplishments, Scenic Drives, seasons, Unique Natural Features, Waterfalls and tagged Aspen, Autumn Gold, Camping, Colorado, Conundrum Hot Springs, fall, Fall Foliage, Hiking, hot springs, Rocky Mountains, travel, Waterfalls on September 23, 2016 by Stephen Jaye. The Weminuche Wildreness appeared to be particularly devastated by the recent Mountain Pine Beetle epidemic. While a portion of the second day was spent above the tree line and in storms for much of the journey, we wound our way in and out of the forest, alternating between hiking through the forest itself, and hiking across an open meadow where we could gaze upon the forest to both our left and our right. Throughout the State of Colorado, and throughout the West, I observe areas where the Pine Beetles have decimated the forest, changing the ecosystem forever. Nowhere, though, have I seen a higher concentration of dead trees. I would estimate that, over the course of the trip, some 70-75% of all the pine trees I saw, were, in fact, dead. But I did notice some signs of life, particularly at the campground Sunday (Day 3) morning. Tucked away amongst the densely pack forests of decimated trees, little signs of life seemed to appear. It reminded me of many American cities, circa 1982, decay being the overarching theme but, signs of life and pockets of hope beginning to appear here and there for those willing to observe. Maybe indeed, the worst has now passed for this particular forest. As was the case for many of our cities, it is possible that in a decade or so, we will revisit areas like this, and see once again a thriving forest, albeit, as was the case with our cities, with a different character? As is typically the case on a three day excursion like this one, the last day was primarily a descent. As we descended, we quickly reached elevations where Aspens, rather than Pine trees made up a significant proportion of the forest. Maybe it is different at this latitude, farther South than the Denver area, where I live and spend most of my time. But, it feels as if in this wilderness, Aspen trees are able to grow at some pretty high elevations. 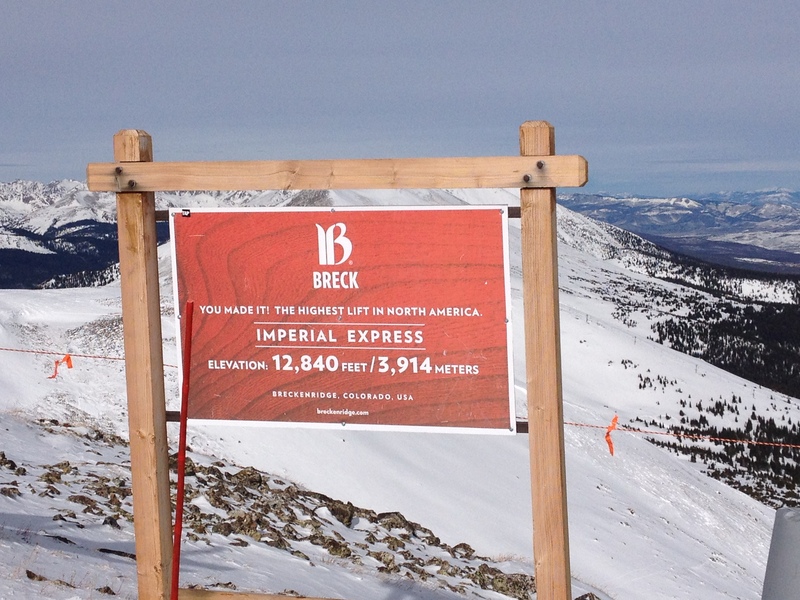 We figured out the tree line here to be somewhere close to 12,000 feet in elevation. When looking upon sections of forest from afar like this, it is easy to picture some of these Aspen trees living at elevations close to 11,00 feet. Over the course of my four years in the Denver area, I had grown accustomed to them disappearing between 9,000 and 10,000 feet. Sunday’s hike was a 7.3 mile trek along the Ute Creek trail (the East Ute Creek trail we had followed the previous day merged with the main Ute Creek trail). The trail alternated a bit, climbing up and out of the valley formed by the creek for some sections, and descending back toward the creek for others. Due to the previous night’s onslaught of rain, which likely impacted the entire valley, the trails on this, the final day, were at times even muddier than the were the prior two days. At the end of three days, our total distance came out around 25 miles. I speculated as to whether the extra distance we traveled stepping around puddles, and veering left and right to avoid some of the muddiest sections of trail, over the course of three days made this a mile or so longer than it would have been had the trails been completely dry. I personally added some distance on top of that. I love side excursions, whether hiking/backpacking, cycling, or on a road trip. And, in addition to the side excursion to the feature known as “the window” the previous day, I took one completely on my own the final day. 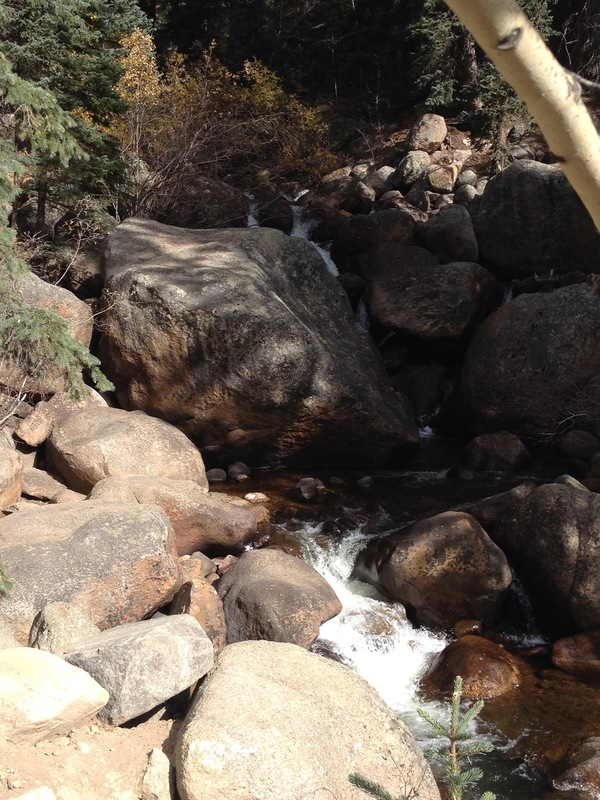 Roughly halfway through the hike, I saw a place where I could cut down to the creek, and see a mini-waterfall. The final part of the day consisted of a small climb out of the Ute Creek valley, followed by a descent back towards the Rio Grande Reserviour. It is inevitable that, on the last day of any trip, we all begin to ponder our return home, and a return to our “normal lives”, whatever they may be. This return, though, is somewhat unique, as a trip into the woods is not just a journey away from our jobs, or certain responsibilities, it feels more like a complete separation from the modern world, or as some people refer to it, the “real world”. All of us were separated, not just from work, but from TV, from the news, from Twitter, and even the manner in which society is structured in the 21st Century. I’m not saying there is anything wrong with any of the partially-rebellious lifestyles I am describing here. We often try to oversimplify the actions and lifestyles of others as being either “conformist” or “rebellious”. When I thought about life in the woods, and the few people that actually do it, live off the grid, and off the land, I think of those people as “rebellious”. But, then I thought of human beings as part of the animal kingdom, and thought about what all non-domesticated animals do. They live in the woods. They hunt their food, many wandering around nomadically. When thought of in that manner, it is us human beings, and our domesticated cats and dogs, that are rebelling against the way the rest of the animal kingdom works by farming our food and setting up permanent shelters. At the conclusion of our journey, we had to actually wade across the Rio Grand River to get to the car, as the trail ended abruptly at the river. This likely explained why we did not see any other people the entire time we were on the East Ute Creek and Ute Creek trails yesterday and today. Shortly after leaving the trailhead, I saw what looked like baby mule deer living along the steepest part of the hill. Like the journey to the Wilderness, the journey home took us by some of Colorado’s highest peaks and most stunning mountainous features. I thought of the “real world” I was gradually re-entering, the life I live and the journey I just took. It is not important whether we are “conforming” or “rebelling”, because, like life in the woods, it can be thought of as conformist or rebellious depending on perspective. Those of us that are honest with ourselves, and with those around us, will undoubtedly find ourselves in both situations. We’ll find ourselves in a place where our choices are the same as those around us, and be suseptable to being labelled “conformists”. We’ll also, at some point, find ourselves in a place where our choices are not those of the majority, and be met with skepticism, hostility, and possibly even pressure to change. What matters most, is not fitting into an image we may have of ourselves, whether it be the upstanding citizen, rebel, outcast, or whatever, it is that we have the courage to be all things, depending on our setting, in order to be true to ourselves. 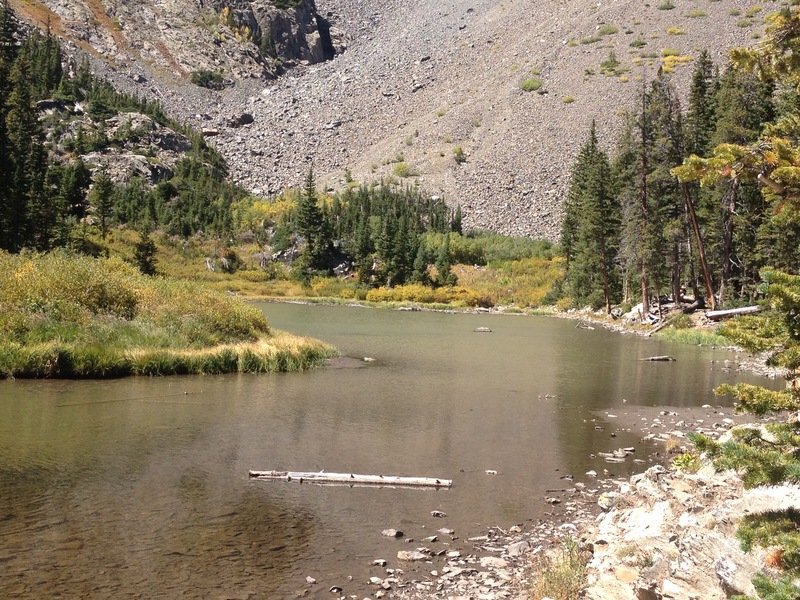 This entry was posted in backpacking, Colorado, geography, hiking, lifestyles, personal habbits, psychology, Waterfalls, wildlife and tagged Backpacking, Colorado, forests, Hiking, pine beetle, Rio Grande Reserviour, Rio Grande River, San Juan Mountains, travel, trees, Waterfalls, Weminuche Wilderness on September 2, 2016 by Stephen Jaye. 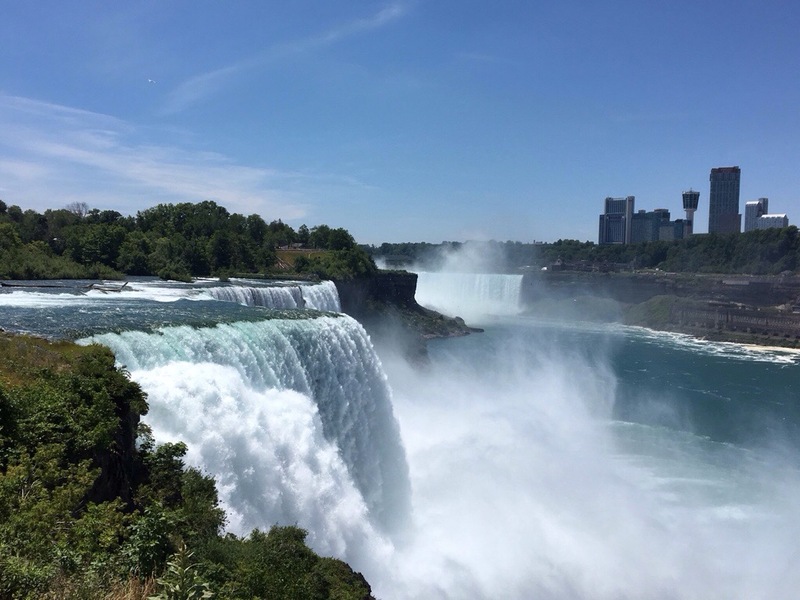 For most visitors to this iconic location, Niagara Falls is the ultimate destination. It is the place one travels to, spends some time at, and then subsequently travels home from. 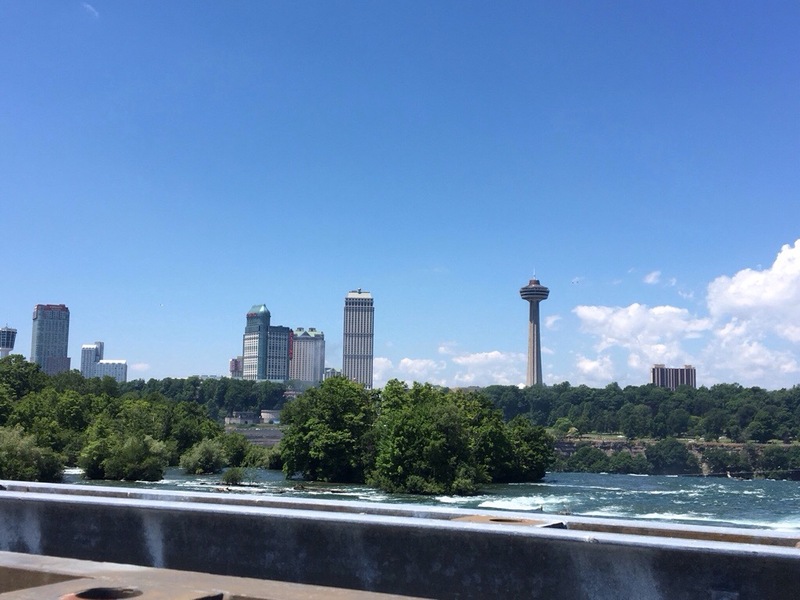 When I think of Niagara’s typical visitors, I think of a family from a place like New York, that made the grueling six hour drive to get there, and will make the grueling six hour drive home. I guess my sometimes fanatical quest to not be like “normal people”, whatever that means, is working. I certainly do not feel normal. My day, which began with an 1:15 A.M. flight out of Denver, involved traveling from airport to airport carrying not luggage or a back pack of sorts, but two panniers, one in each hand. 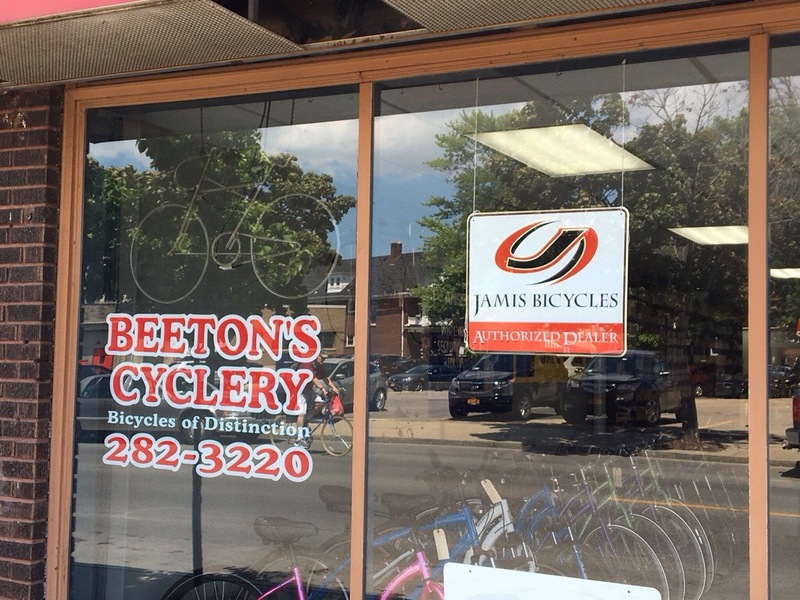 In a way my journey actually began at a tiny bike shop in Niagara, NY called Beeton’s Cyclery. I need to give this place a serious shout out. I shipped my bike here. It arrived on Friday, June 24th. I told them I needed it by Monday, and they were able to get the bike assembled (to package a bike for shipping, the pedals, handlebars, seat, and front tire must be removed) and apply new handlebar stripping in time for me to arrive late morning Monday and start my voyage. 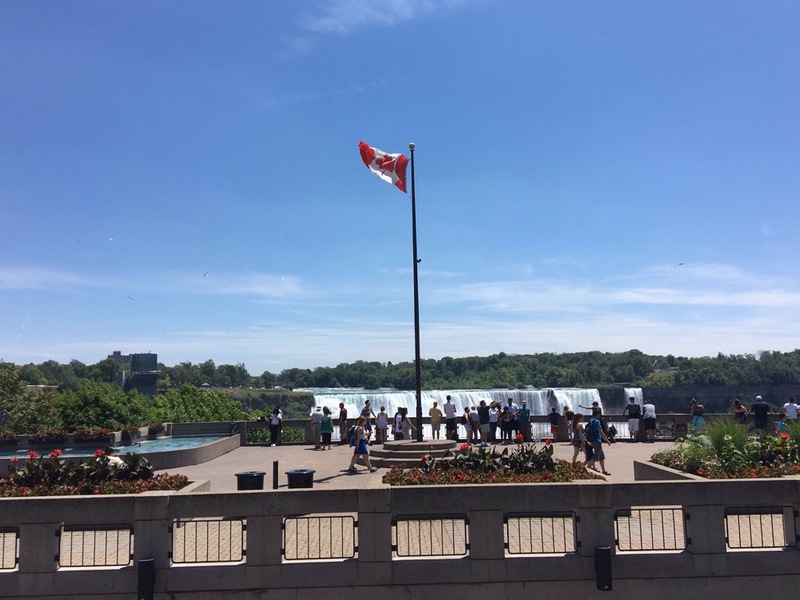 I brought my passport, knowing that I wanted to visit the Canadian side of the falls. 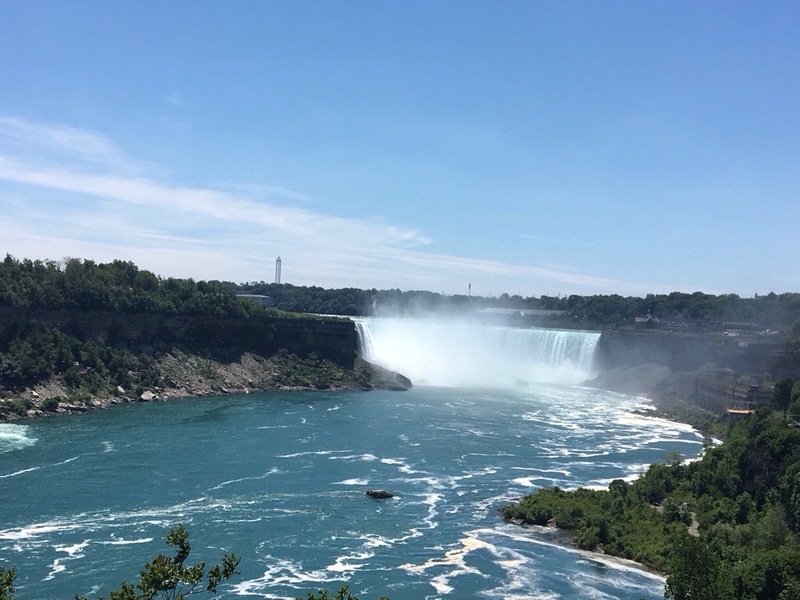 Anyone who has been to Niagara told me that the Canadian side was “better”. I wasn’t sure what that meant. The contrast between the two sides is quite stark. Niagara, NY is sort of depressing. I had trouble finding a place to grab a snack, while I gazed ahead at tall buildings and casinos on the other side. Still, I wanted to see the falls from the U.S. side first. The plan was to meet up with my friends on the other side and spend the evening there. 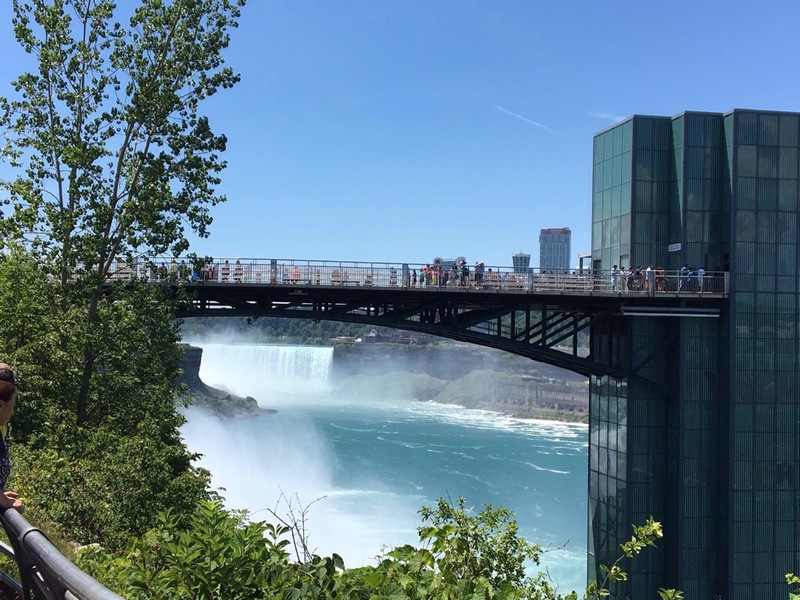 On the American side, the view of the falls is somewhat awkward. Well, it is from he riverfront. There is this overlook, where theoretically the view is spectacular, but it costs like $18 to go on it, so I didn’t. Getting to the falls on the Canadian side involved going over the same bridge that cars travel over. 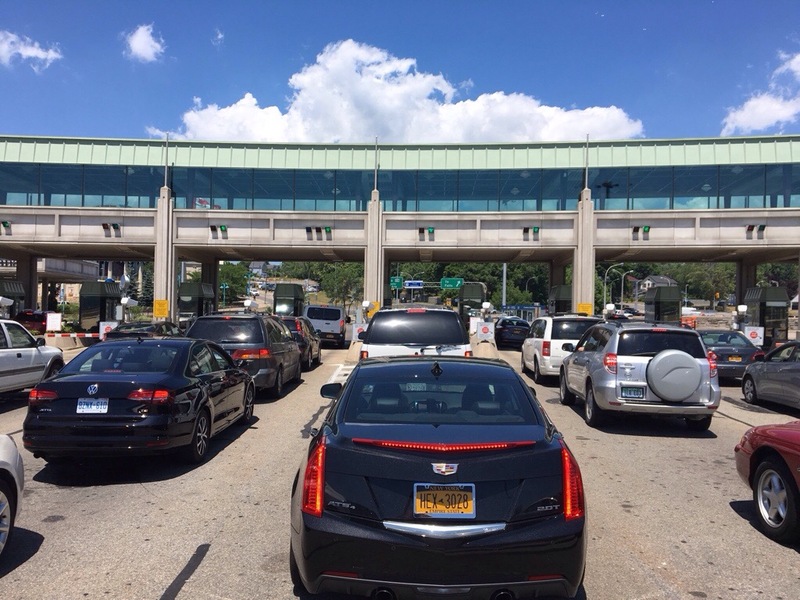 The toll for bikes is only $.50 (I believe cars is $3.50), but I still had to wait in the same traffic cars wait in to cross into Canada. 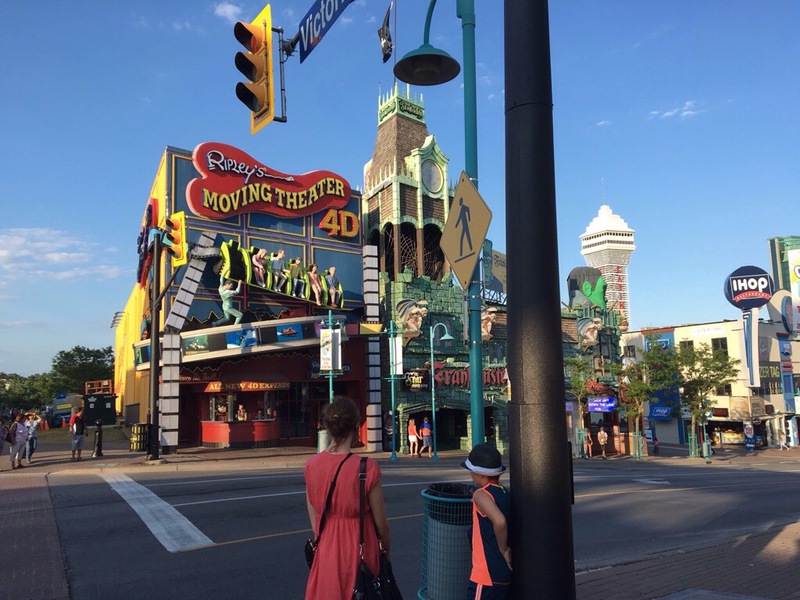 Once I crossed the border, I realized why most of the tourist attractions, hotels, and buildings and such were on he Canadian side of the border. By happenstance of geography, the views from this side of the river are better. 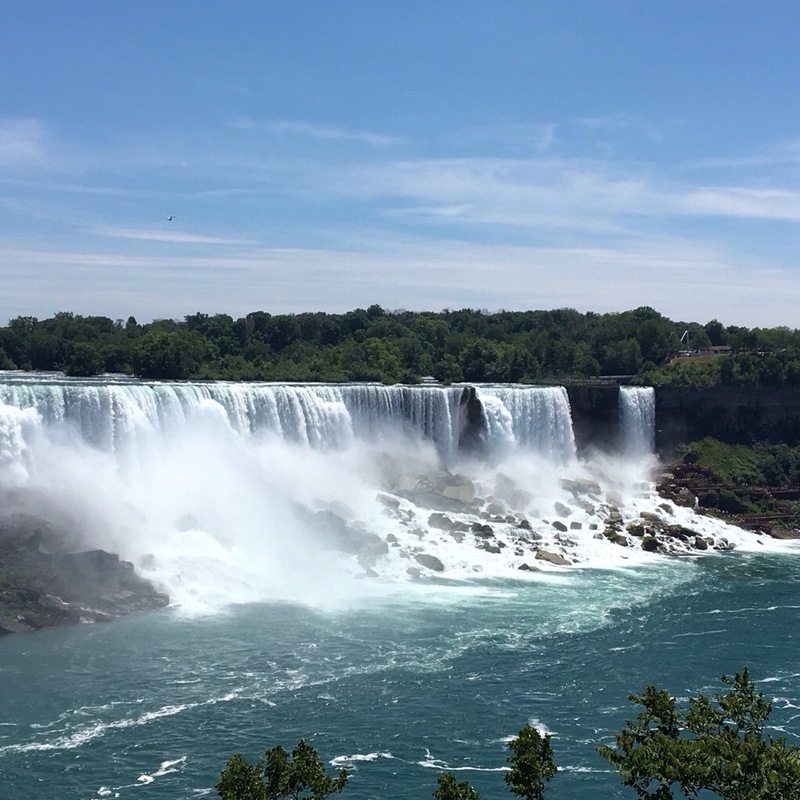 This includes both falls that make up what is called “Niagara Falls”, the American Falls, which are on the U.S. side of the river, which splits around an island, and Horseshoe Falls, which are on the Canadian side. Both falls are magnificent. Horseshoe Falls is more powerful, but I actually prefer American Falls, particularly the way the water hits he rocks and sort of foams up. Both falls are best viewed from Canada. I’ve always loved waterfalls for some reason. Much like one’s taste in music or art, it is not something that can be explained. Waterfalls just feel natural to me, they feel peaceful and even sometimes graceful. In the world of waterfalls though, Niagara Falls is pretty much the opposite of any of the waterfalls I typically view out West. 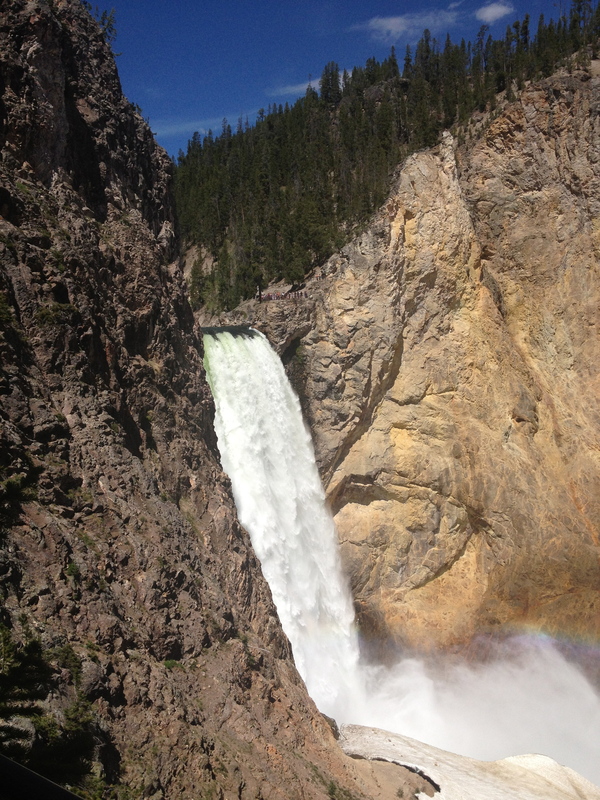 Waterfalls in the west, such as the Lower Falls of the Yellowstone, tend to be tall and skinny, falling a much greater vertical distance, but carrying much less water. Niagara is high volume but the vertical drop is actually less than 200 feet. I also could never imagine waterfalls in the west being as commercialized as these. 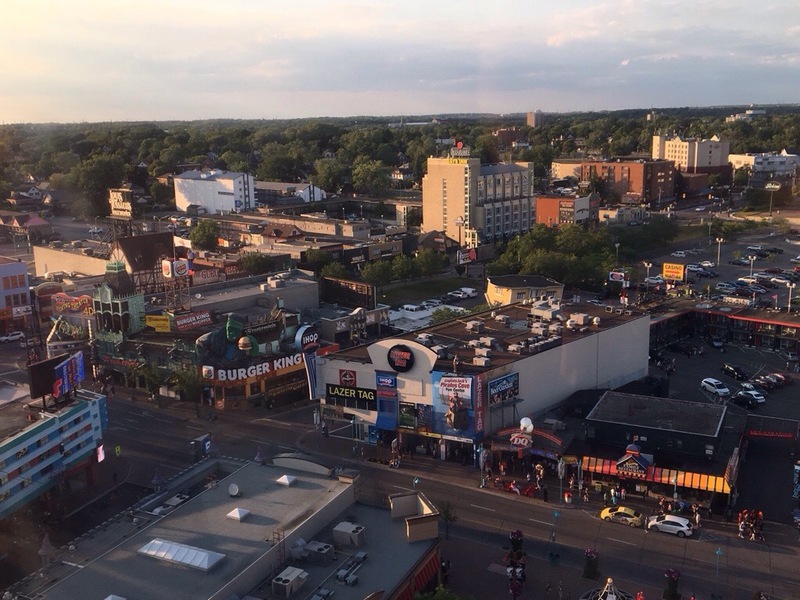 In addition to the $18 charge for getting on the overlook in the New York side, the town of Niagara Falls, Ontario is filled with every establishment one would expect to find in a tourist trap packed together at a density I have only seen in one place before; Gatlinburg, Tennessee. 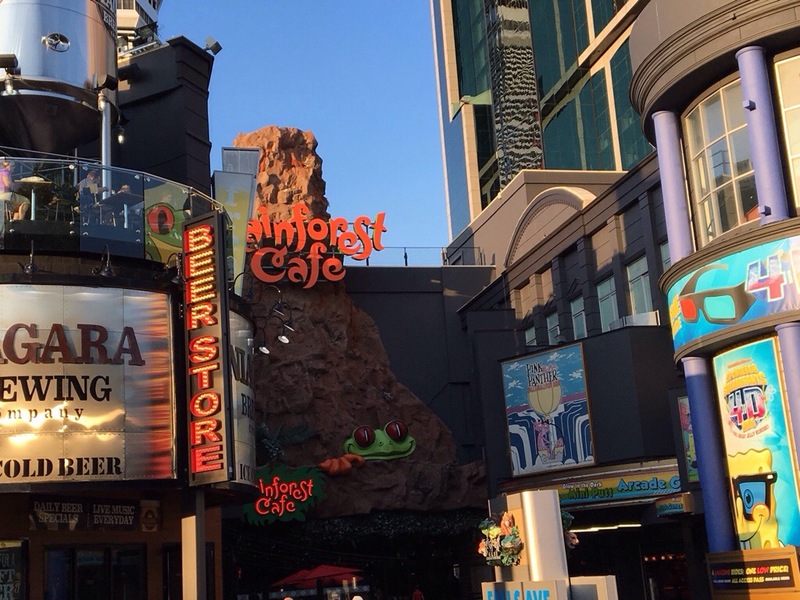 Gatlinburg, like Estes Park, is outside a popular National Park. 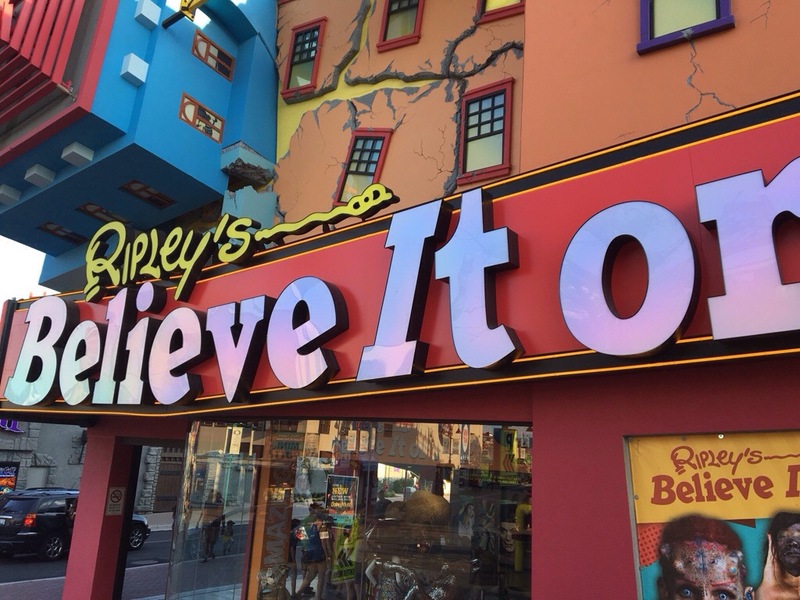 The hotels, mini golf, and Ripley’s Believe it or Not, are miles away from the iconic natural beauty that made those places worth preserving through the National Park system. All of these places in Niagara Falls are within a mile or so of the falls. 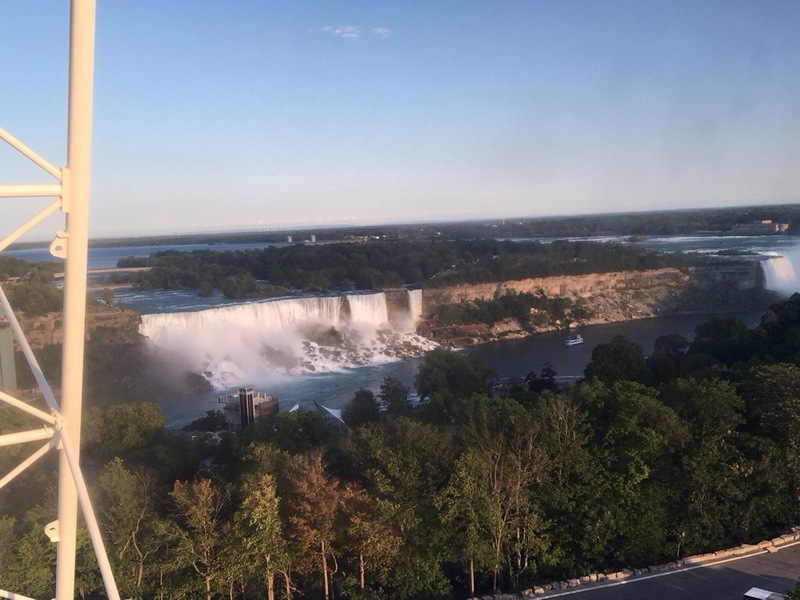 In fact, one can get another perspective of the falls by riding a ferris wheel next to the mini golf course across from the laser tag. Tomorrow a long journey by bicycle begins. Tonight, I get to continue to savor these falls, as they are lit up at dusk as part of a nightly illumination. This, like the rest of town, adds a man made touch to a natural phenomenon. Some love it, some hate it, most find a way to enjoy it regardless of the opinion they expose. As for me, my focus turns to the days ahead, for unlike most of the others watching the illumination, my journey is only beginning. 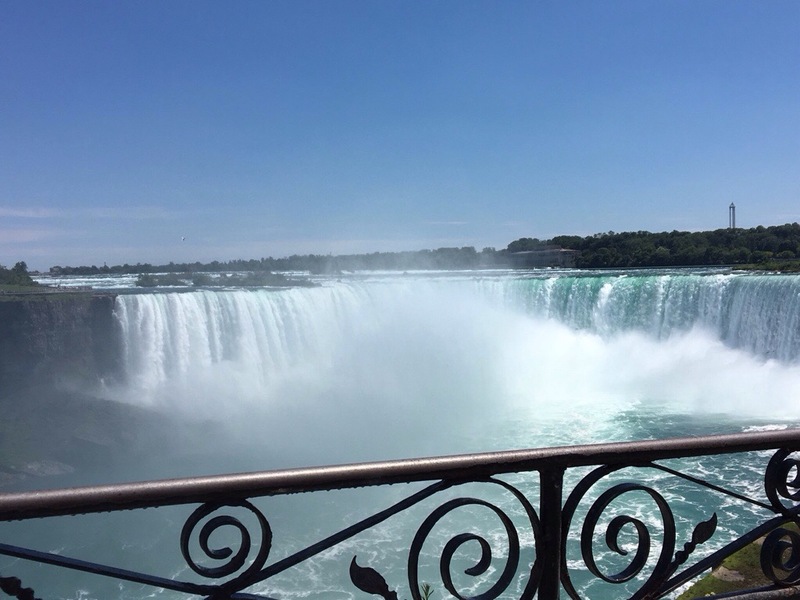 This entry was posted in Canada, Cycling, tourism, Waterfalls and tagged Beeton's Cyclery, Canada, commercialism, Cycling, niagra falls, tourism, Waterfalls on July 3, 2016 by Stephen Jaye. As part of their push to encourage tourism in Iceland, Iceland Air now offers a variety of one-day excursions that travelers can embark on whether they are visiting Iceland specifically, or taking a stopover on their way between Europe and North America. These one-day tours offer a variety of options for experiences, including which places to visit and what types of activities to take part in. For all of them, the general idea is the same; a bus picks tourists up at various hotels in Reykjavik, and gives visitors what basically amounts to a one-day “Taste of Iceland”. My tour of choice was the Glacier Hike and Northern Lights tour, which offers a lot of what I was looking for out of my time in Iceland. The Northern Lights is something I had never seen before. In America, we hear about such phenomenon occasionally. Roughly once a year, we will hear in the news about a particularly strong solar event occurring, and the potential for the Northern Lights to be visible much farther from the North Pole than is typical. Sometimes that zone would even reach the Northern parts of the United States, and news outlets would provide maps of where the lights could potentially be visible. For years, living in Chicago, such stories would provide a particular brand of torment for someone that is curious about seeing the Northern Lights. It is not possible to see the Northern Lights from such a large, lit up city. One would need to travel somewhere less populated. To get outside the populated metropolitan area, I theoretically would be able to travel in any direction, but it makes little sense not to go North, as the lights get better the farther north one travels. However, North of Chicago is Milwaukee, and the area in between the two cities is populated enough to make it less than ideal for viewing the phenomenon. So, the prospect of getting in a car and driving out to see the Northern Lights was always a multi-hour trip. Some combination of time constraints, or frequent wintertime cloudiness in the Midwest always stopped me from driving up to Central Wisconsin (or Central Michigan) to try to see the Northern Lights. The tour started like every one of the Iceland Air excursions, with a mid-sized bus going from hotel to hotel picking people up. The bus went to about six different hotels to make pick-ups, finally leaving Reykjavik around noon. The tour group was quite mixed. There were a couple of other Americans, a few Canadians, and even two people from France on our tour, but the majority of the group was from Great Britain. I have relatively little experience traveling to Europe (this trip, and a trip to Italy, Austria, and Germany in 2012), but on both occasions I ended up hanging out with tourists from the UK, specifically England. I don’t know what that says about America, or who I am as a person, or if it is just due to a common language, but I am curious to see if that happens again next time I go to Europe. Driving East out of Reykjavik, towards Iceland’s South Coast area, the first thing I notice, which is common throughout Iceland are lava fields. Across much of Iceland, the land is covered with ashes from previous volcanic activity. The previous day, I had learned at the Volcano House in Reykjavik that Iceland is one of the most volcanically active places in the world, as it sits on the ridge between the North American and Eurasian plates, which are drifting apart from one another. In geologic terms, this is actually happening quite quickly. On average, a volcano occurs somewhere on the Island once every 5 years, and as the plates pull apart, the Island is literally growing at a rate of 2 cm per year. 50 years from now, Iceland will be 1m wider than it is now! About 30 minutes into the trip, the bus passed by the hotel where one of the scenes in the 2013 film The Secret Life of Walter Mitty took place. In the movie the volcano Eyjafjallajökull erupts, and Walter is lucky enough to have been picked up by a friendly local to escape before being covered in ashes. In real life, this gigantic volcano erupted quite explosively in 2010. In the most unfortunate of circumstances, the wind happened to be coming from the Northwest that day, and the ashes covered the sky over Great Britain and much of mainland Europe halting air traffic for several days. The next stop on this tour was Skógafoss, one of Iceland’s largest waterfalls. Iceland is not only a hot spot for volcanoes, but it is also a hot spot for waterfalls. This is due to the glaciers, which cover 15% of the land area of the island, the terrain and relatively moderate maritime climate. Waterfalls like this can be found all over Iceland, and they probably look even more amazing in summer, when the ground appears lush and green! The main event of this tour, the Glacier hike, worked for me on multiple levels. I love being outside, hiking and getting some exercise. There are many times, when on vacation, I purposely try to find the most strenuous activities possible. I especially do this when I am on a cruise or in some other kind of vacation package, where I know an activity does not need to be super challenging, or even that physically exhausting for them to be labelled as such. I also got to try something new, hiking with crampons. 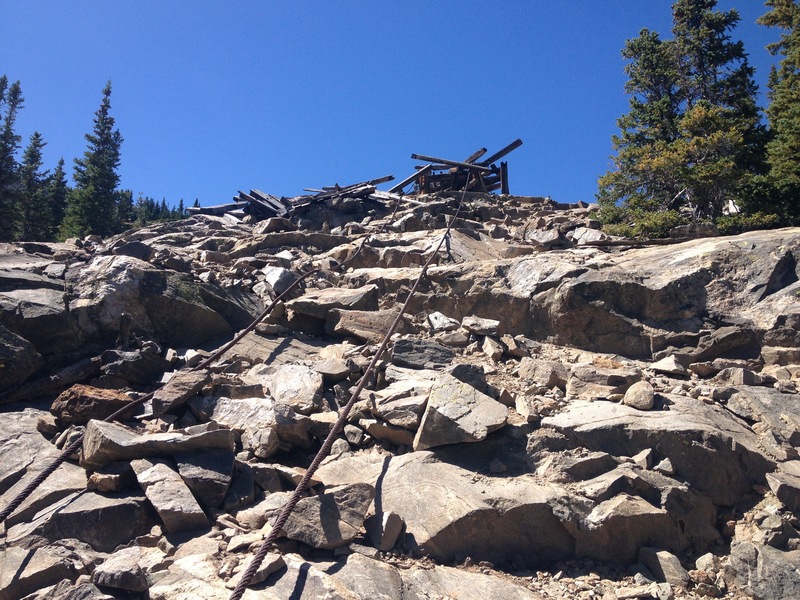 Now, I am not sure they were absolutely necessary for this particular hike, as back in Colorado I had hiked in areas that were steeper and more slippery and gotten by without them. But, I did learn how to use them, how to attach them to my hiking boots, and how to walk with them on, a good thing to know for future activities down the road. In addition, the glacier, and what our tour guides told us about it was quite fascinating from a scientific perspective. Apparently, this particular glacier is receding at a fairly rapid pace. Along our hike, the tour guides pointed out where the glacier used to end in past years compared to where it ends now. As recently as 2010, the glacier covered nearly all of the area near the entrance of the park that we traversed before getting onto the current glacier. When this portion of the glacier melted, a gigantic lake was left behind in the lower lying area. The tour guides then informed us that we are actually witnessing a the formation of a fjord. Roughly an hour into the hike, we had climbed to roughly 100m above sea level. However, the ice was thicker, somewhere between 150m and 200m. Over time, the ice had pushed the land beneath it below sea level. Once these glaciers melt, the area will be under water, creating a fjord in this very spot. This is one of many spots where this process is happening as we speak. As a weather enthusiast, who had studied meteorology, I asked the tour guides what the primary mechanism was for the melting glacier. Specifically, I asked if it was reduced winter snowfall or warmer summer temperatures. They indicated that both were contributing factors, but also mentioned that, since temperatures in Iceland are commonly quite close to freezing, the area was starting to see precipitation fall in the form of rain (as opposed to snow) more frequently. I could sense that, as even on this February day, the snow I stood upon was quite wet. But that was not even the most fascinating scientific aspect of this tour. Almost everyone is familiar with climate change, and it’s become the subject of sometimes-ridiculous debate. The most fascinating thing I learned about this glacier is that fact that, due to the presence of volcanic ash, the glacier is creating terrain that is constantly changing. Here, volcanic eruptions spill out on top of the ice, causing ice to melt faster in some areas. The ice then flows in a manner that brings more ice into areas that are currently in “valleys”. Even when there is no new volcanic activity, the cycle of ice flow and differential melting can happen rapidly enough that each year the terrain of any given section of ice is significantly different from the previous year. Literally, if I were to return to Iceland at the same time next year, and come to this very glacier, the hike would be significantly different, as the terrain would have been significantly modified. Amazing! The glacier hike concluded a little after sun down, which was right around 6:00 P.M. After the hike, the tour bus took us to a hotel restaurant in the area for a traditional Icelandic meal. To my surprise, the meal did not involve fish. For some reason, I had this impression that since Iceland is an island in the North Atlantic, it would be a place where almost every meal consisted of fish. Instead, the traditional Icelandic meal was a hearty meat soup. On the tour bus, I learned that the Icelandic cow, which is a special breed of cow that is smaller than the ones most of the world is familiar with is quite popular on Icelandic farms (they actually once voted in favor of keeping the cow over switching to a more efficient Norwegian cow). In addition to these cows, many farms also keep lamb and sheep. After dinner we drove in search of an ideal place to view the Northern Lights. This involved driving around and looking at weather conditions in a manner that actually seems reminiscent of storm chasing. We drove around for hours, and every time it felt like we had found the right conditions (i.e. clear skies), something would change. At one point, sometime between 9 and 10 P.M., as drove through an area where it suddenly started to snow! At 11:30 I was in despair. We were clearly headed back into Reykjavik, and I thought we were just going back to the hotel. After all, the tour does not guarantee that the Northern Lights will be seen. It can’t be guaranteed. The weather is always changing, and the solar activity, which leads to the Aurora phenomenon, is also quite variable. Oddly enough, though, just after midnight, we pulled into a pier on the far West end of town, along the shores of the Atlantic Ocean, on a peninsula. Our tour guide informed us that we would now be able to view the lights, and, sure enough, they appeared. I was unable to capture them on camera in a manner that would do this amazing natural phenomenon any justice. I mostly just sat there, in awe, watching the lights glow and move from side to side along the horizon. I thought about how amazing this phenomenon was. I wondered if people who lived here took it for granted, noticed it less, the same way many people become less appreciative of what is in their own back yards. At the end, I just thought about what an amazing day it was, from when the tour began, over twelve hours ago, until now, ending with this amazing light display. This entry was posted in food, Glaciers, hiking, Iceland, tourism, Unique Natural Features, weather, winter activities and tagged ash, climate change, Eyjafjallajökull, Glaciers, Iceland, Skógafoss, tourism, volcanoes, Waterfalls, weather on February 26, 2016 by Stephen Jaye. Those that love to travel, whether they be the rare few, the people who get to travel for a living, or those who find a way to travel as much as possible, understand that Planet Earth is full of amazing places! One of the things that makes traveling interesting is the wide variety of types of places to visit, all of which will produce different scenery, and different experiences. It is nearly impossible to describe or capture the true range of experiences one could theoretically attain through travel, but the Discovery Channel’s Planet Earth Series does a pretty good job. When people come to visit me here in Denver, I typically take them, in some capacity, into the mountains. I will particularly ensure that a trip to the mountains gets on the agenda if I get visitors from places like Chicago, which couldn’t be further from any kind of mountain range. After all, one of the reasons we travel is to see things we do not typically see. From Denver, it doesn’t typically take too long to get somewhere spectacular. About half an hour west of downtown, there is a segment of I-70 where the full prominence of the Central Rocky Mountains suddenly appears in quite spectacular fashion. I remember being amazed by the view that pops out in front of me the first time I traveled up I-70. Many photographs have been taken from this location, and it was even noted as a point of interest at the History Colorado Center. Now that I have lived in Denver for over three years, a short excursion into the mountains typically takes me to a place I have already been, sometimes even a place I have been numerous times. However, as is noted by the Planet Earth video series, these places often look quite different during different seasons. Those that visit Colorado in the winter or spring will see mountains covered with snow. This view, from I-70 near Genesee, will look significantly different, likely in just a few weeks. October is sometimes a tricky time of year to determine activities in Colorado’s Rocky Mountains. 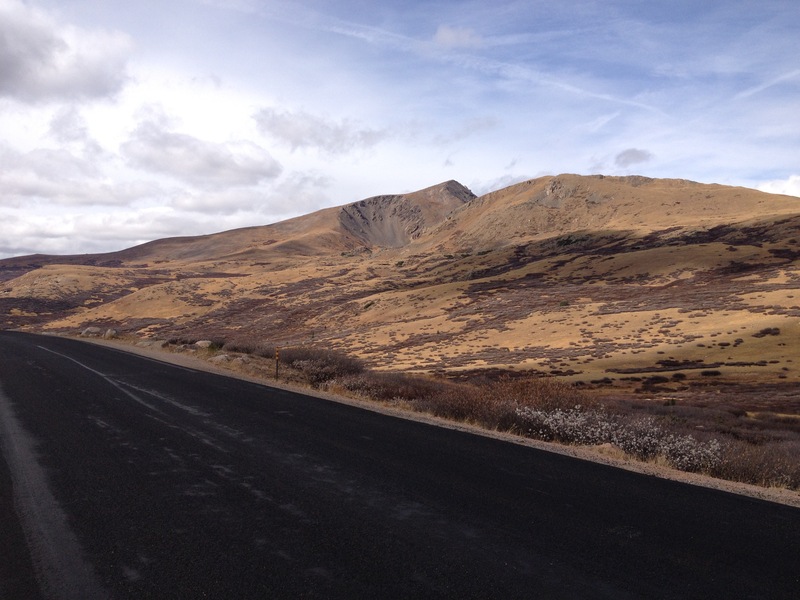 It is that transition season where often times conditions are no longer favorable for summer activities (and many of the seasonal roads have already closed for the season), but a significant snowpack has yet to develop. 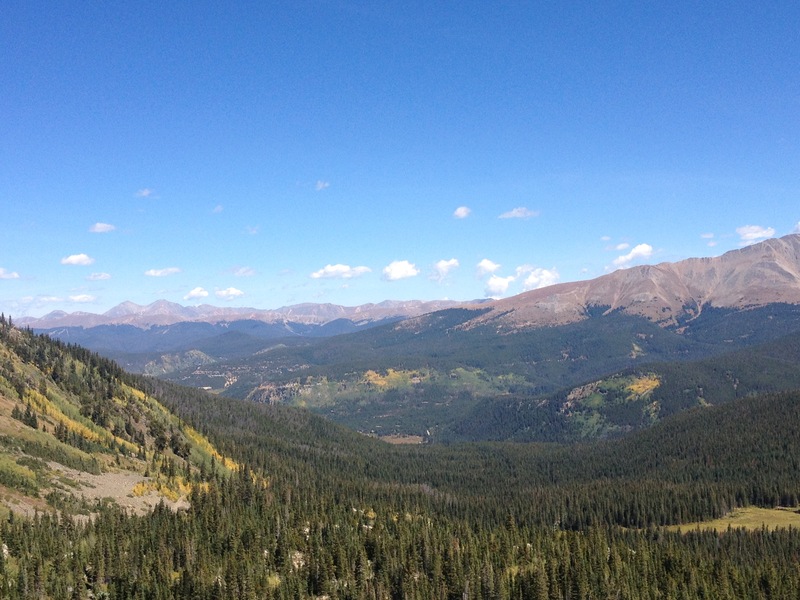 This fall has been anomalously warm here in Colorado, and the extent of the snowpack that has developed in the mountains appears in this picture below. However, according to the National Operational Hydrologic Remote Sensing Center (NOHRSC), by mid-late October, the typical snowpack over the high terrain of the Central Rocky Mountains is still less than a foot (and not consistent year to year). This map displays snow depth anomalies for Sunday, October 18th according to the NOHRSC. The actual snow depth, across the entire region, was zero. 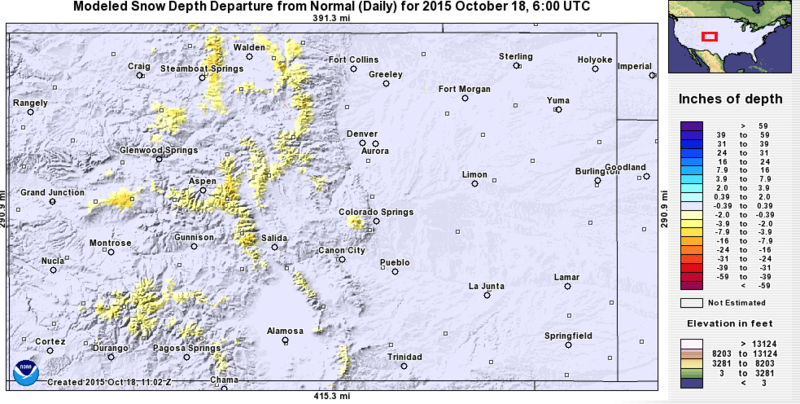 The anomalies show just how far below normal this is, which, in the highest terrain on this map, falls into the 4 to 8 inch range, indicating that even at locations above 14,000 feet, there is typically not too much snowpack by mid-October. Knowing that most seasonal roads would still be open due to the lack of snow, but with somewhat limited time for an excursion into the mountains, we opted to take a trip over Guanella Pass, which is still less than an hour’s drive from Denver. 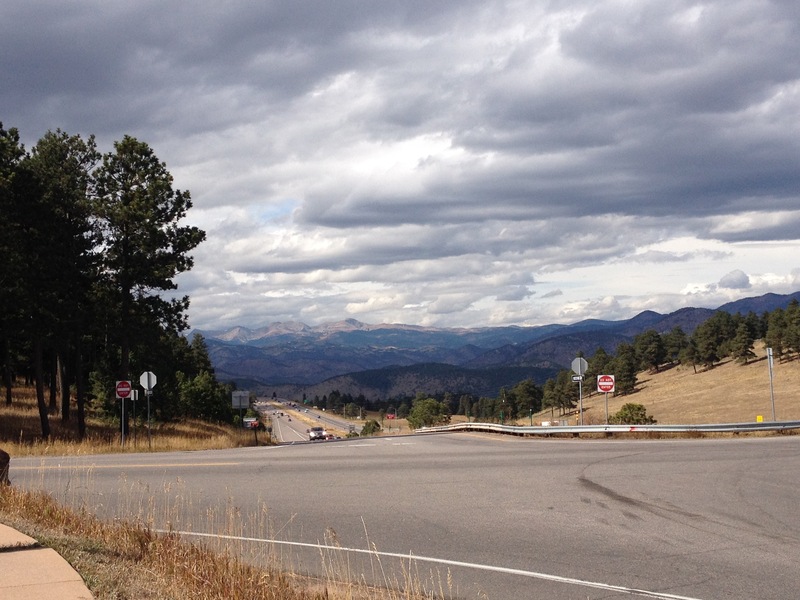 Despite having been there several times, the experience for me was already new, as a new paved road had just been built, connecting the town of Grant, along highway 285, with Georgetown, along I-70. This new road is likely to get mixed reactions, as traveling along it is now much easier (and now possible without AWD). However, there are sections of this pass that are popular among campers, particularly people looking for a quiet camping experience. On Sunday’s excursion, I encountered several groups of motorcycles. The prevalence of motorcycles, and the noise they make, could possibly make some of the Guanella Pass campers seek a more remote experience elsewhere. Without having to focus on driving over rocks and bumps, I noticed places I simply did not notice on previous drives up Guanella Pass, like this waterfall. However, that was not the full extent of the new experience I had on Sunday. The final approach to the summit took me above the tree line, where I suddenly got an eerie feeling from what was around me. It’s hard to describe. It felt almost like I was on another planet. It was isolated. Most of the time that we stopped at the summit, we were the only ones there, and my car was the only one on the road. 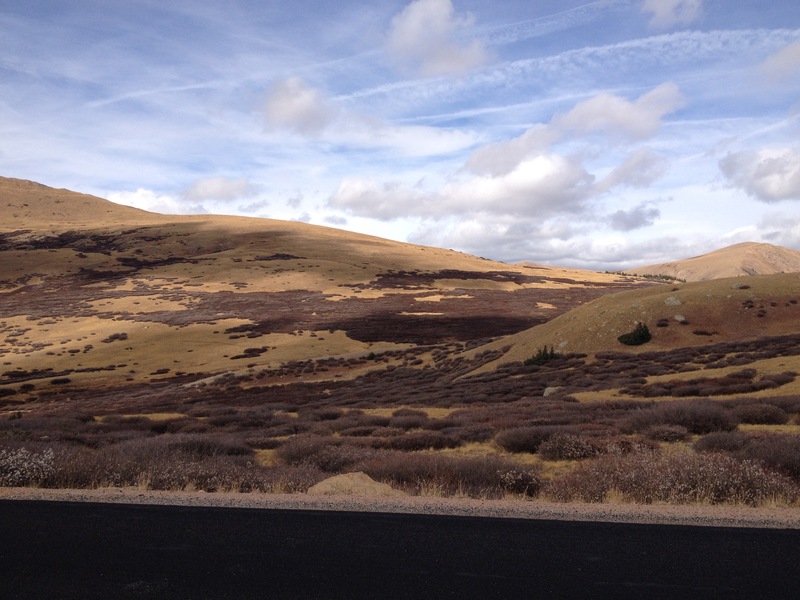 The sagebrush of the alpine tundra had taken on brown color that I am not accustomed to seeing. Some combination of the sun angle, unusual ground color, and isolation definitely gave me a really strange feeling. It was eerie, creepy, out of this world, I really did not know what to make of it. It was just, well, strange. However, I came back feeling glad that different seasons can create different experiences out of the same places. Typically, when I make the trek up to elevations just above the tree line, there is one of two experiences. 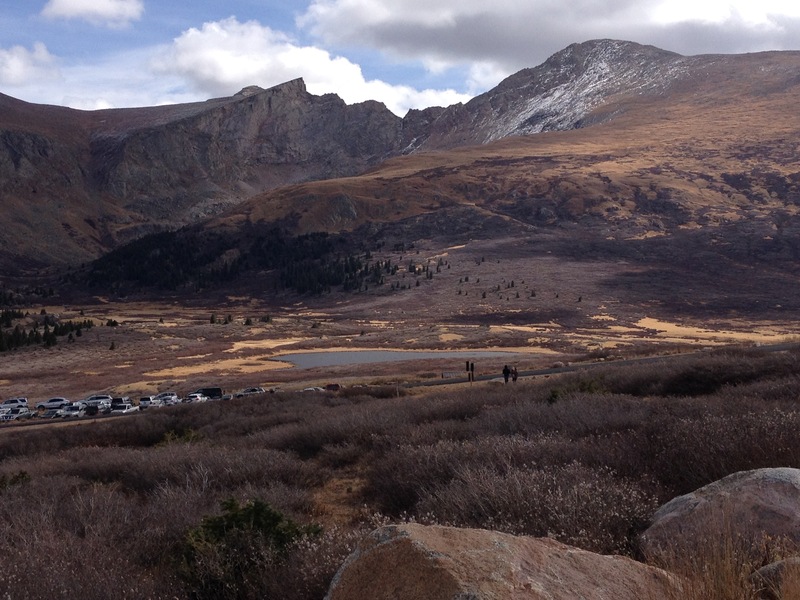 The alpine tundra is white in winter (and often still white well into the springtime), and green and lush in the summer. In October, though, it took on a whole new color, one I had not seen before. This planet has plenty of places that are unique, unlike any other place on earth. Some of them even feel out of this world. Sunday’s experience at Guanella Pass reminded me of two things. A lot of these unique experiences that we plan trips to get to are seasonally dependent. And, sometimes these experiences can happen unexpectedly. 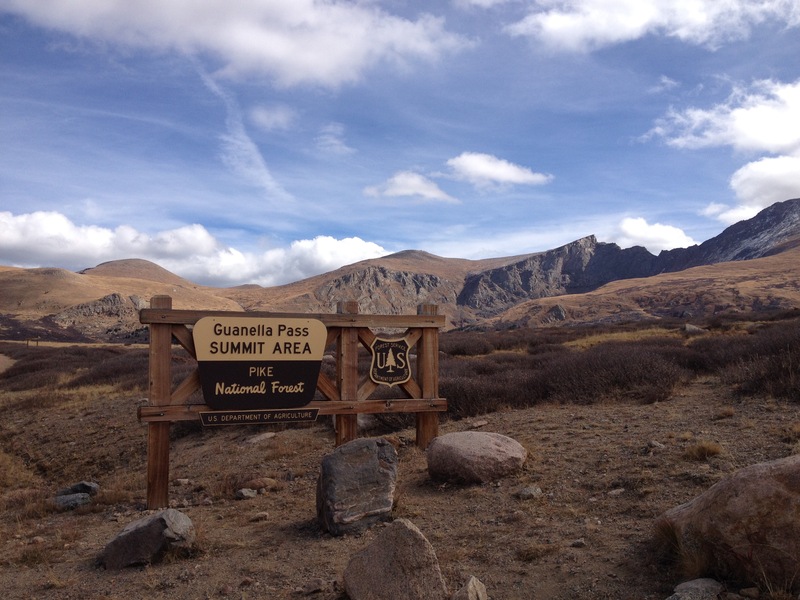 This entry was posted in Colorado, Road Trips, Scenic Drives, seasons, Waterfalls and tagged alpine tundra, Colorado, fall, Guanella Pass, seasons, Unique Natural Features, Waterfalls on October 20, 2015 by Stephen Jaye. 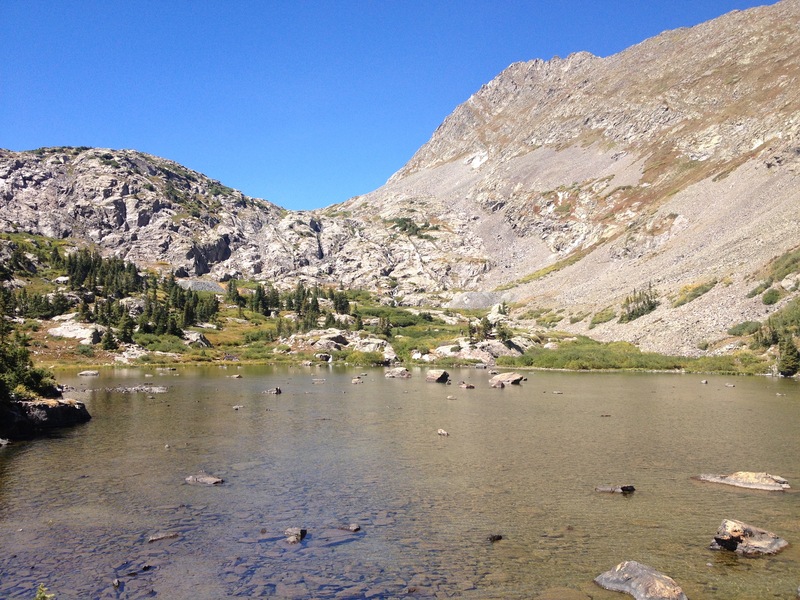 Sometimes recreation in Central Colorado can be just plain overwhelming. I remember when I was preparing to move to Colorado, and took a look at a Colorado DeLorme atlas I had just purchased. DeLorme makes an atlas for every state in the country. These atlases are great for those who love outdoor recreation. Not only are features such as campgrounds, hiking trails, waterfalls, and parks labeled on the maps themselves, but each map contains a dozen or so pages in which hot spots are listed. These include key places to camp, fish, hunt, hike, bike, and such, as well as a list of “unique natural features”. When I looked through my Colorado DeLorme atlas, I was suddenly overwhelmed by the amount of options available to me for many of the activities I enjoy. I kept wondering, though, how the heck I would go about something like picking a place to hike when there are so many options. I was actually worried that some days I would end up going nowhere due to analysis paralysis. The most effective networks, whether they be all of the trail networks in parts of Colorado, or New York City’s network of subways, are overwhelming, and sometimes take awhile to learn. 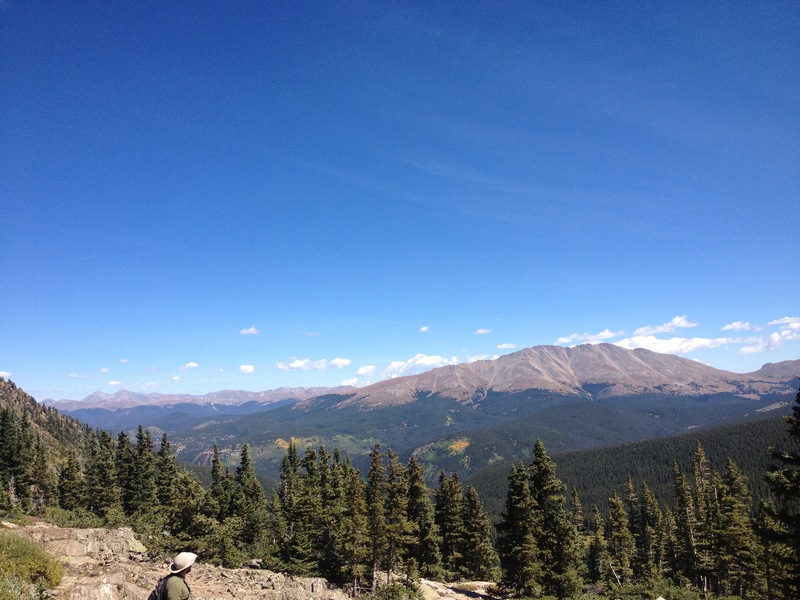 However, the same way any New Yorker can get by without owning a car, due to all of the train lines in the city, a Coloradan can find the right hike for many different situations and many different desired experiences. Last Friday I had a friend in town from Chicago who does not get to experience mountains on a regular basis. 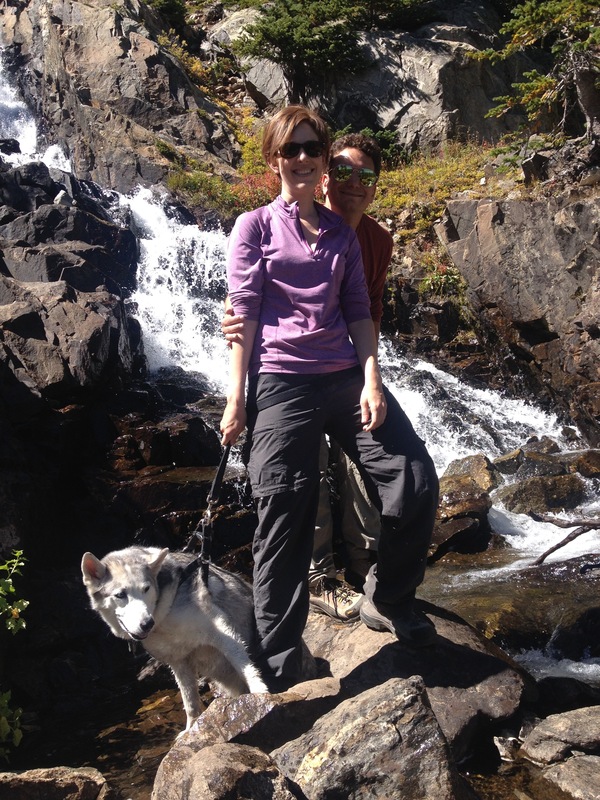 On previous trips I had taken him to Rocky Mountain National Park. This time, I wanted to take him somewhere different to see some different scenery in a different part of the state. 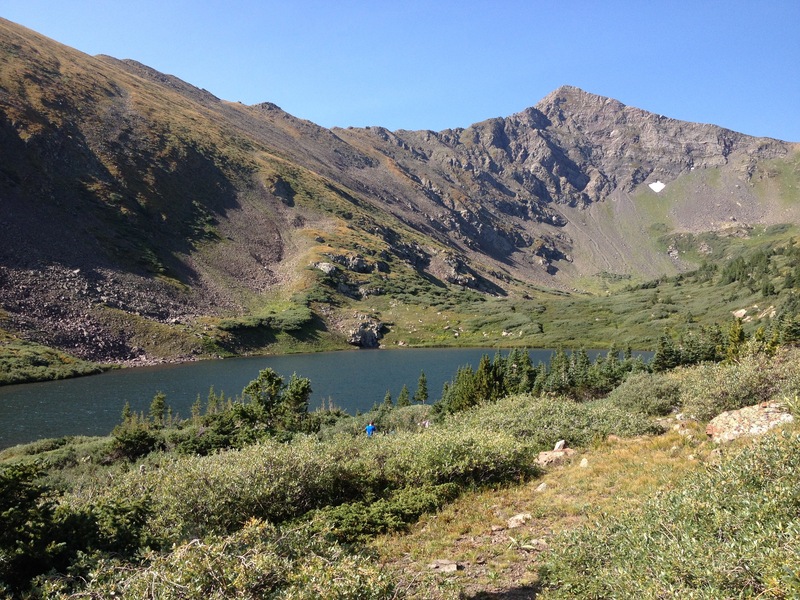 The most talked about hikes in this part of the State tend to be the “14ers” to the South. These hikes tend to be challenging, and, sometimes are just as much about accomplishing something (particularly to some people) as it is about the experience of hiking. By contrast, the Spruce Creek Trail certainly fits into the “moderate” category for difficulty. The first part of the trail is kind of a mixture of flatter and steeper areas. 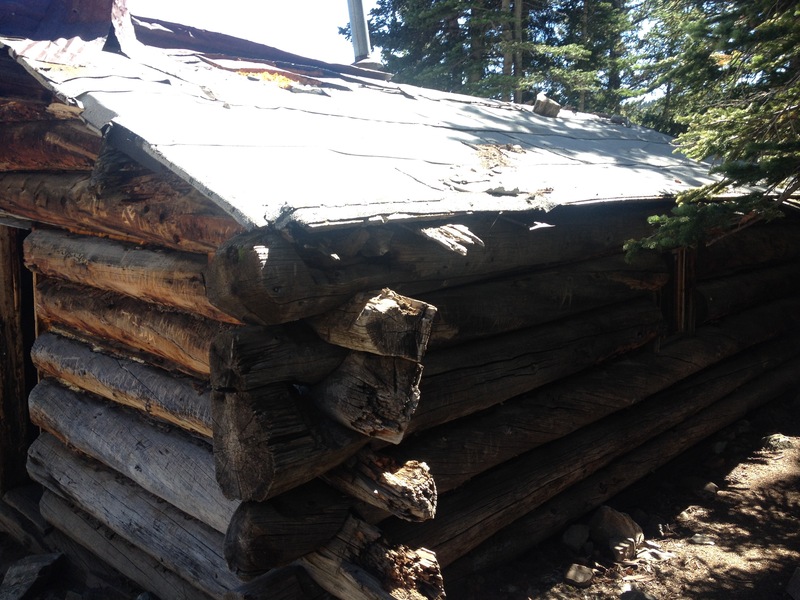 Roughly two miles into the hike we encountered this random cabin that still seemed partially functional. With a stove and a ladder that leads to an upstairs area it is reminiscent of the cabins that people purchase as second homes. However, it was kind of in disrepair and there were several holes in the floor. 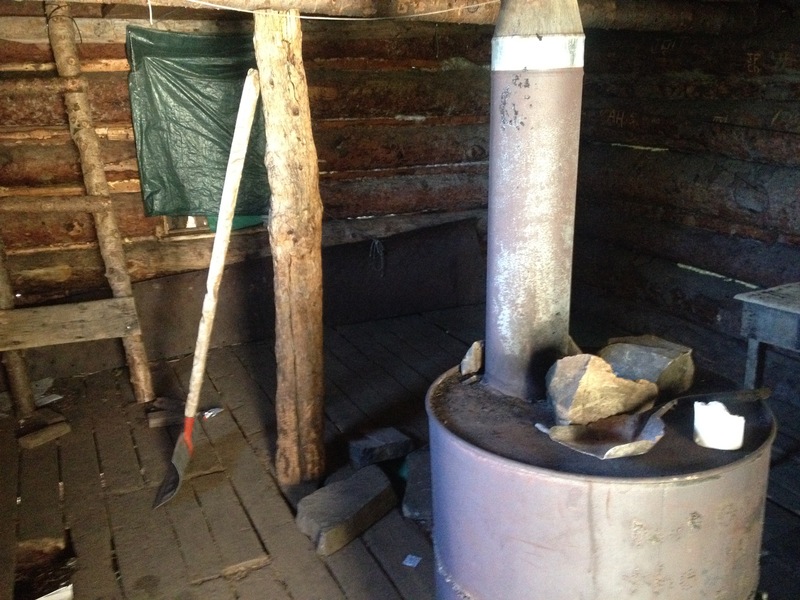 Still, I wonder what this cabin is used for. Do people actually stay here at night from time to time? Did people originally stay here when this place was built? Is it used for some other purpose, like filleting fish, or fleeing storms from time to time? 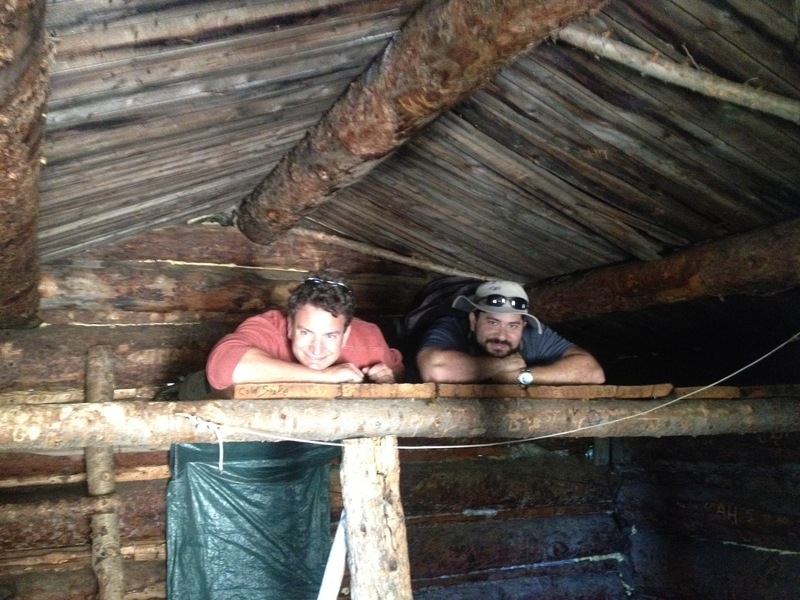 After all, this cabin is fairly close to the first major lake one encounters on this hike- Mayflower Lake. It is around here that the trail reaches somewhat of a point of inflection. Above this elevation, the trail becomes steeper. I honestly should have expected this type of experience. One thing I note every time I ski at Breckenridge ski resort is the fact that the steeper terrain tends to be on the higher parts of the mountain. If I ski on Peaks 7, 8, or 9, which is the part of the mountain closest to town and the lower part, I notice that any run I chose becomes progressively flatter as I descend. 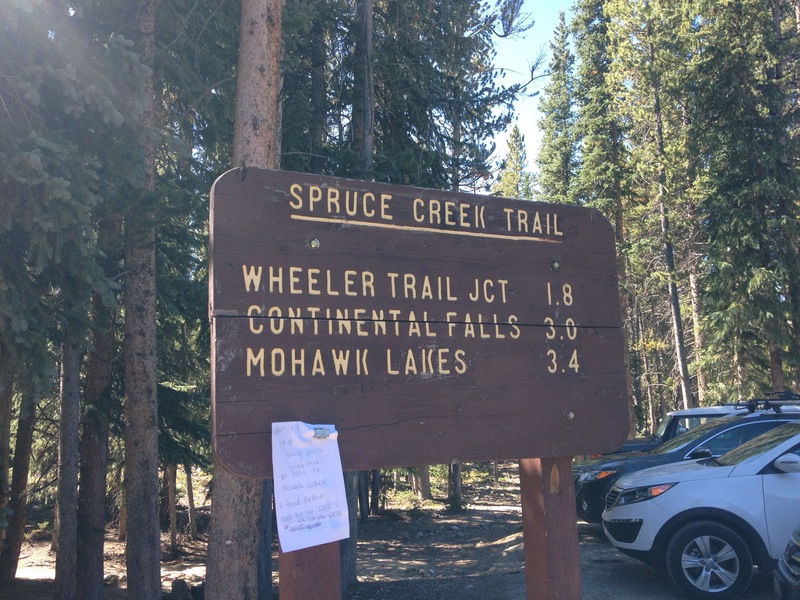 The Mohawk Lakes, and the Spruce Creek Trail are seriously no more than 3 or 4 miles from the boundary of the ski resort. Therefore, it makes perfect sense that one would experience the same kind of terrain. 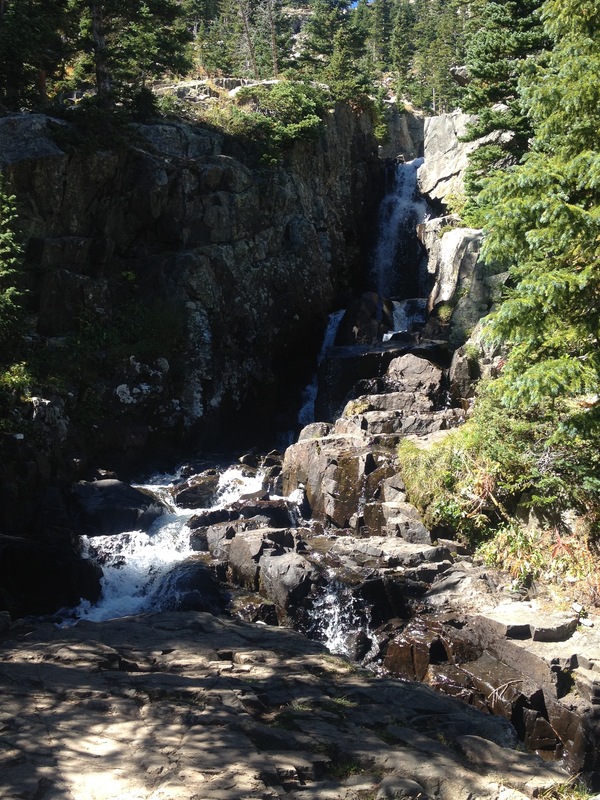 The trail encounters Continental Falls several times as it switches back and forth across the mountain. The last several hundred feet of climbing up to Lower Mohawk Lake is somewhat of a scramble making it quite different from the smooth and well marked trails that we started out on. It was already nearly 1 P.M. when we arrived at Lower Mohawk Lake. We stopped to eat lunch and decided to forgo hiking all the way to Upper Mohawk Lake, a decision I eventually came to regret after learning that we would only have had to hike an additional 0.4 miles, and only climb another 250 feet or so. I have really come to appreciate this time of year; September, early fall. There is a lot of pleasant weather, and many people have even told me this is the best time of year for hiking in Colorado. In the summertime, particularly in August, there is a daily thunderstorm threat associated with the North American Monsoon. This year that threat ended right after Labor Day when the prevailing weather patterns changed ushering in a drier period for Colorado. On Labor Day I got caught in a brief afternoon thunderstorm. There has not been one since. It is almost as if Mother Nature was aware of, and chose to abide by, our society’s labeling of Labor Day as the “end of summer”. In August mid-afternoon would typically bring at least some major cloud formations reminding hikers of the thunderstorm threat. Last Friday the sky remained clear throughout the day. I actually think I could not have picked a more ideal time for this particular hike. One thing I hear about the Spruce Creek Trail is that it is prone to becoming muddy during periods of heavier precipitation. 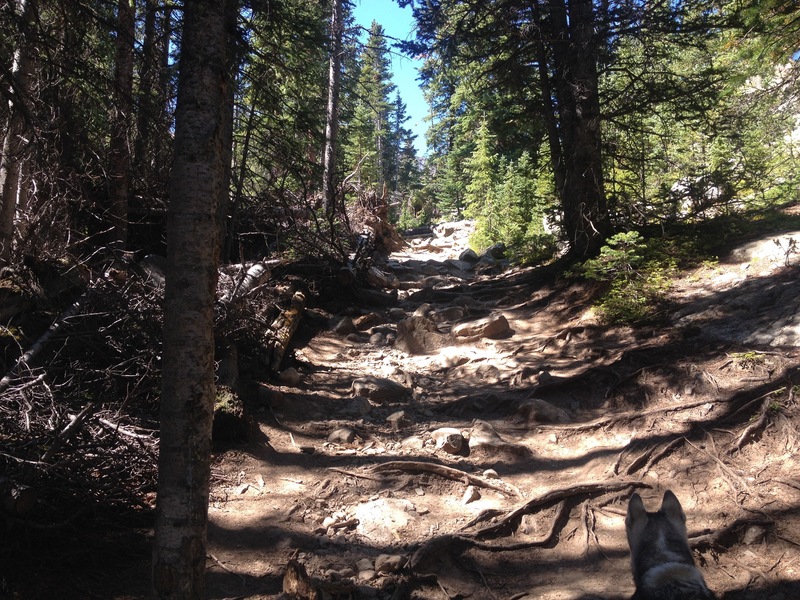 These types of trails can be problematic in early summer when there is heavier stream flow. The later part of this summer, and now September, has been much drier across Colorado. The hike ended up being exactly what we had wanted; a moderately challenging hike that brought us to some unique scenery. There are many places, both geographic, and in life, where one cannot just go about finding a trail that matches the desired experience exactly. Whether it be picking a place to hike, chosing a neighborhood to purchase a home, or picking a place of employment, sometimes the option that matches exactly what we want simply is not available at the right time. So, we end up finding something that is pretty good, a decent match, but not exactly 100% the experience we had been looking for. It’s just a part of life. 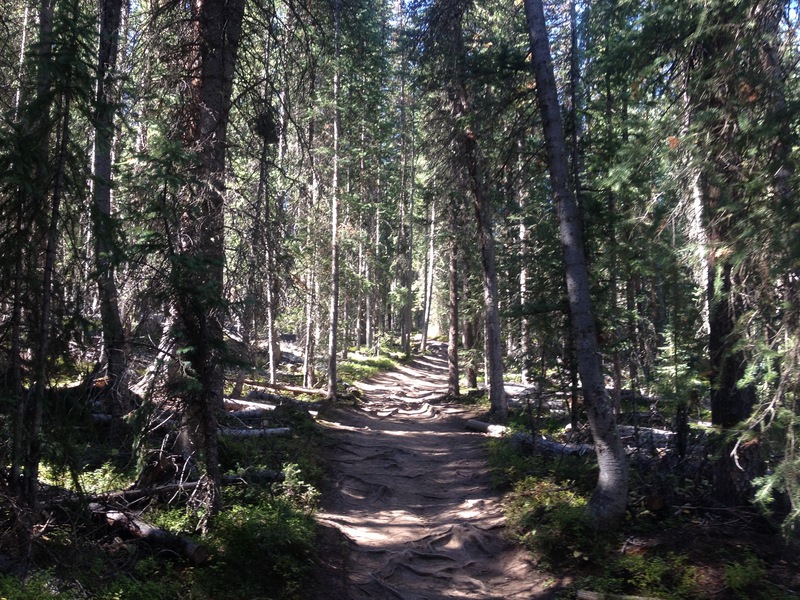 But, here outside of Breckenridge, I found the trail that matched exactly what we wanted, and am thankful for it. 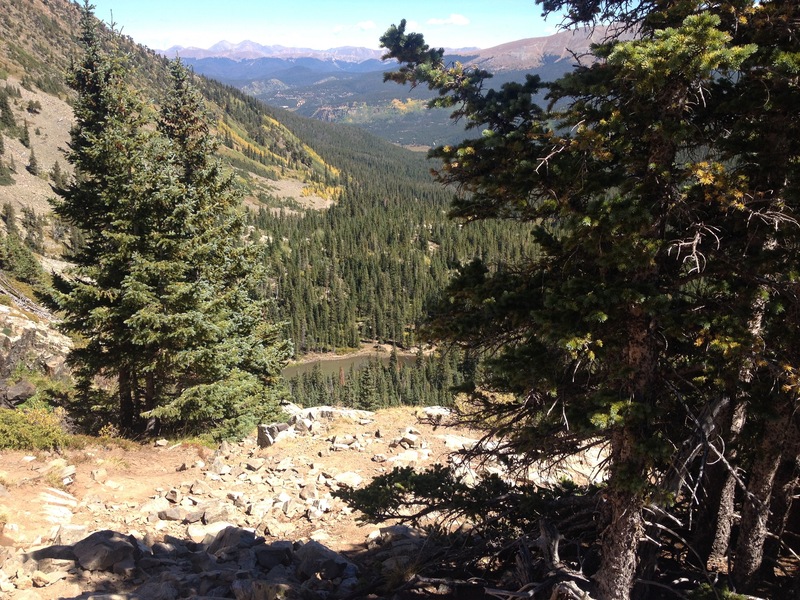 This entry was posted in Colorado, hiking, seasons, Waterfalls, weather and tagged Breceknridge, cabins, Colorado, DeLorme, Hiking, Mohawk Lakes, September, Spruce Creek Trail, Waterfalls on September 13, 2015 by Stephen Jaye.